From bytes to books, and files to frying pans, our lives are dominated by storage. in 1956, IBM’s 305 RAMAC (Random Access Method of Accounting and Storage) was the size of a refrigerator and stored roughly 4.4 megabytes. Now, hard drives are about the size of a deck of cards, and may hold upwards of a terabyte of information. On the other hand, The Self Storage Association of America has reported 53,000 Self Storage containers, an industry yielding $ 20 billion alone in the USA. Our lives are dictated on a daily basis by storage, how much we can put away into how small of a bin. But what about the things we don’t want to put away? Organization is just as important as storage with research showing that more organized people are generally more effective and happier people. Dana Gionta, Ph.D. in Occupational Hazards notes “It’s about conserving your mental and physical energy, to experience the other wonders of your life that give it meaning and joy.” And with the cold weather coming, this means more people, inside the house, for longer periods of time. Owner Jennifer Michael of CraftyStitches offers the perfect solution: Caddies for everything. 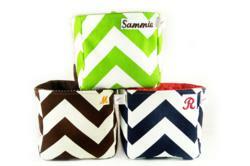 Made of 100% cotton, these signature caddies can be hand-washed and line-dried for continued use. CraftyStitches caddies are 100% American Made and sourced locally. Get organized, get happy, and get American Made!